All about one of the greatest world class football player ever. Pelé began playing for Santos at 15 and his national team at 16, and won his first World Cup at 17. Despite numerous offers from European clubs, he could not leave Brazil because of a law keeping him there. In 1961 President Jânio Quadros had Pelé declared a national treasure, thus enabling Santos to keep Pelé for almost two decades until 1974. 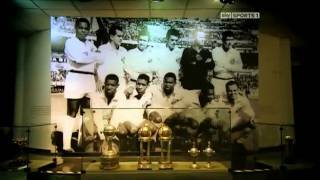 With Pelé within their ranks, Santos reached their zenith by winning the 1962 and 1963 Copa Libertadores, the most prestigious club competition in South American football. In 1962 Santos became the first football club ever to win four out of four competitions in a single year, thus achieving the quadruple. Pelé’s electrifying play and penchant for spectacular goals made him a star around the world. His team Santos toured internationally in order to take full advantage of his popularity. Pelé played most of his career as a deep-lying forward. Pelé’s technique and natural athleticism have been universally praised and during his playing years he was renowned for his excellent dribbling and passing, his pace, powerful shot, exceptional heading ability, and prolific goal scoring. He is the all-time leading scorer of the Brazil national football team and is the only footballer to be a part of three World Cup-winning squads. In 1962, his second World Cup victory, he was on the Brazilian squad at the start of the World Cup but because of an injury suffered in the second match, he was not able to play the remainder of the tournament. In November 2007, FIFA announced that he would be awarded the 1962 medal retroactively, making him the only player in the world to have three World Cup winning medals.Since his retirement in 1977, Pelé has been a worldwide ambassador for football and has undertaken various acting roles and commercial ventures. In August 2010, he was named the Honorary President of the New York Cosmos.